A polymer is a repeated unit of monomers. It contains addition of small units of molecules by chemical process. Natural polymers are type of polymers that are made by natural sources such animals, plants and micro-organisms. Natural polymers are compounds which are synthesized by addition polymerization or condensation polymerization. Polymers that are derived from natural sources contain the natural properties and are biologically developed. Some of the natural polymers include cellulose, DNA, RNA, starch and fermentation, protein polymers, marine polymers, silk and wool. Cellulose is the most important type of the natural polymer and its main application is in textile, medical, food and beverage, paper and pulp industry. Natural polymers are renewable, non-toxic, economical and available in huge quantity. These properties made them easily usable for various medical purposes. 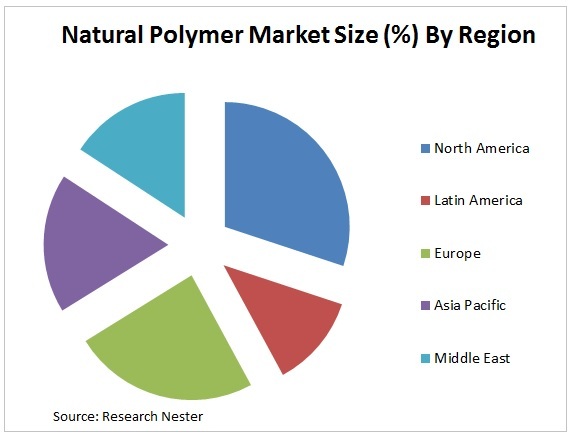 By region, global natural polymer market is segmented into North America, Asia-Pacific, Latin America, Europe, Middle East and Africa. North America is anticipated to lead the global natural polymer market on the account of increasing application of the natural polymer in the various application industries such as food & beverages, construction, pharmaceutical and oilfield. Asia-Pacific is anticipated to be the fastest developing region for the global natural polymer market on the account of rising population and rapid industrialization. Moreover, the rising demand for the natural polymer from the construction industry is also major factor for the expansion of the global natural polymer market during the forecast period. The rising demand for the natural polymer from the various applications on the account of its eco-friendly, non-toxic and biodegradable nature is anticipated to drive the global natural polymer market during the forecast period. Additionally, the increasing demand for the non-biodegradable petroleum products coupled with the volatile prices of the crude oil is the major growth driver for the global natural polymer market. The increasing investment in research and development by companies operating in the natural polymer market in order to develop various types of polymers is anticipated to further drive the global natural polymer market. The other factors anticipated to support the market growth are no side-effects related to natural polymer in comparison to other polymers. However, stringent government regulations regarding the deforestation and safety of animals are anticipated to act as a restrain for the global natural polymer market. The availability of alternatives of natural rubber such as natural rubber also hinders the growth of global natural polymer market.